Expand your IR system to other rooms. Our Dual Frequency IR wall plate receiver can be installed in any standard single gang box or P-ring. This unit is a great add on to our advanced IR system and easily connects to the control block using standard cat 5e or cat 6 cables. Strip back approximately ½” of the conductor on TWO of the pairs. 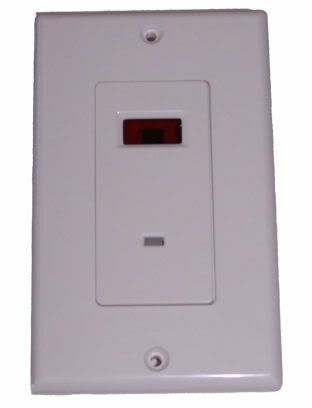 Match the connection markings from the In Wall Infrared receiver wall plate to the connecting block of the advanced IR receiver. Most States require that when running cable inside walls, you must use fire rated cable such as CL-2 or CL-3. Also, to avoid possible noise interference from induction from 115 VAC, never run low voltage and AC lines together. For best appearances, mount the device at the same height as installed light switches. Place IR Wall Plate in direct “Line-of-Site” of the handheld remote control up to 35’ away and within a 120° of the device. Infrared receivers pick up infrared signals within line-of-sight, and within 40 feet or so, and turn the signal into electrical impulses. These electrical impulses can be carried around the home on wires, and then turned back into infrared signals by emitters.